Aquagen Alkaline water Drops are a simple and effective way to ensure that every glass of water you are drinking is in a healthy Alkaline range. Not only will our Alkaline Drops boost the alkalinity of your drinking water to between an 8.5 to 9.5 pH but it also adds much needed and hydrating electrolytes such as sodium, chloride, potassium and trace minerals creating a truly hydrating experience. 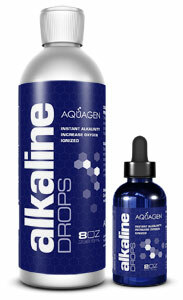 Combining our unique ionizing technology, with our core aquagen stabilized oxygen technology, Aquagen Alkaline Drops allow you to create an oxygen rich, high pH water you will feel the difference with. COPYRIGHT © 1993-2011 Aquagen Inc.